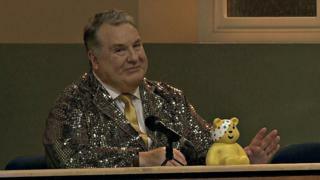 Celebrity astrologer Russell Grant is to appear in BBC television's longest-running soap Pobol y Cwm. The 66-year-old, who competed in Strictly Come Dancing and Celebrity MasterChef, appears as a guest judge at a dance event on the 10 November show. Pobol y Cwm is broadcast on Welsh language TV channel S4C and Grant learned the language whilst taking part on reality TV show Cariad@iaith. "I loved every bit of it, and everyone was so lovely," said Grant. The stargazer's special guest role sees him surprise villagers of Pobol y Cwm's fictional village Cwmderi at a local fundraising dance competition put on in memory of a young character Courtney, who was a big Strictly fan. Pobol y Cwm, first aired in October 1974, is filmed in BBC Wales' Roath Lock studios alongside Doctor Who and Casualty. Grant, who lives in a Welsh speaking area of Gwynedd in Maentwrog, said he was "impressed" by the standard of dancing and was delighted for the opportunity to his Welsh skills.